In our daily grind, we sometimes forget that we are divine creations. We forget to take time out, even if only for five minutes, to reconnect ourselves to our spiritual batteries. Distractions can get the best of us, and before we know it, we get bogged down and find ourselves under stress as we are pulled into too many directions. 1. Refresh yourself. Take a break. Get away from the energy of the situation and regroup your own scattered energy. Take a walk. Take a few deep breaths. Remove yourself to a quiet place for meditation or reflection. Your energy and vigor will return. 2. Remain calm. Working yourself into a frenzy by worrying about things is an accelerant to more intensified worrying. Worrying leads to doubt; doubt leads to fear. Fear leads to shutdown. This is counteractive, counterproductive and counterintuitive to creativity. Instead, keep a positive attitude. The more negativity you generate, the more you'll attract. Likewise, the more positivity you generate, the more you'll attract. 3. Regain control. When you are out of focus, it could be because you are taking on too many tasks at once. Concentrate on one task at a time. Write them down and cross them off your list as you complete them. Bigger tasks can be broken down into smaller tasks. 4. Review your priorities. Look at the big picture. Become aware of your workload and what should be done first. Some perspective of your "workscape" can save a lot of wasted time and effort. 5. Reprioritize your priorities. Do the most important things first on your list. Then follow through from there. Stick to what's on your list; otherwise, you will spend too much time flitting from one distraction to another. 6. Remagnetize yourself. Reconnect with your Inner Self, Inner Guidance System, God/Source, etc. Our spiritual batteries are always charged and ready for our use, but when we allow ourselves to be distracted, we become disconnected. We demagnetize ourselves, leaving ourselves open and vulnerable to negativity in various forms. Imagine yourself as a powerful magnet, attracting everything you need to move forward. 7. Remind yourself of your purpose. You have been blessed with certain abilities; you are here to share your gifts and talents with others. 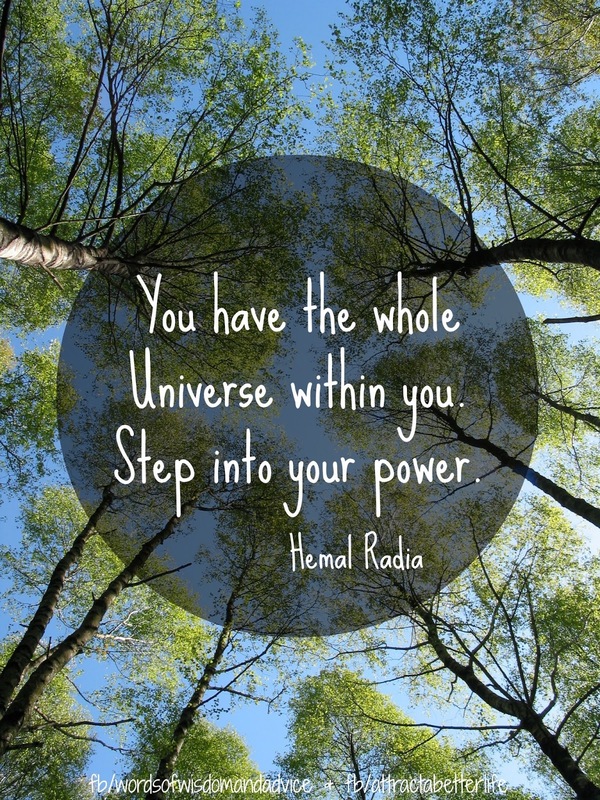 As my friend and Law of Attraction coach Hemal says, "You have the whole universe inside of you," working for you, not against you. Remember: you are in control. Life may throw things at us from different directions in an attempt to distract us from ourselves and our mission, but we can control how we react by taking a proactive approach, one that allows us to step into our power, rather than out of it. How do you regain your focus? Do you have any tips to offer? Thank you, Hemal Radia, for inspiring this post. For more on Hemal, please visit his website at http://manifestingandlawofattraction.com/ and at https://www.facebook.com/HRadiaPage. You are very welcome, Hemal! Thank YOU! I appreciate all that you do...you are such an inspiration. Thank you for being the Lightworker that you are to help others grow into their authentic selves. Much love! I saw Hemal's quote today and liked it and then see that you posted this. Wonderful! It is amazing as this was the subject of the Oprah & Deepak Chopra meditation this morning, too. It was about getting centered and being touch with your infinite Self. Hi Kathy! Hemal is such an inspiration! I felt led to share it. The Oprah/Deepak meditation is on my list to do today! Looking forward to it! So much energy is aligning; it's awesome! Thanks for stopping in and commenting! Penny, this is such an inspiring post and the tips are wonderful. I for one, need the reminders from time to time. I think we all do, Deb! Thanks for stopping in and commenting. Walking The Tightrope Between "self" And "Self"
Do You Know Your Ancestry?